There are times when payment information changes or was not entered and it becomes necessary to add or update payment information. Changing the fund/payment information on service request or individual charges can be done up to the point where the charges are successfully billed. Information can be updated by the user, core staff, or PI/Lab Manager. This will open of the service request fund window, which lists the charges that are part of the service request at the top. 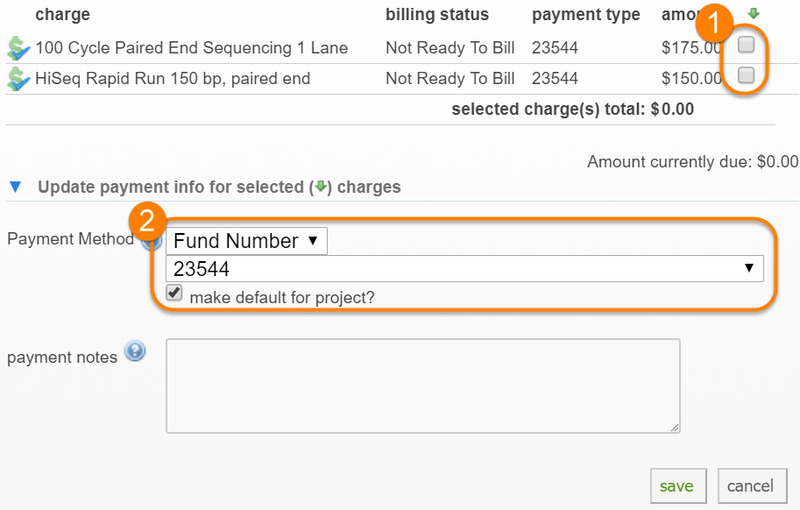 Select the charges to which you want the new fund information applied. Select or change the desired payment method, as discussed in more detail in Payment Methods‍. By checking the "make default for project?" check-box, the selected payment method will be used for any new charges added to the project. Select or change the desired payment method, as discussed in more detail in Payment Methods‍, and click "Save".